Quilt Canada was finally near me this year. I've been saving up for it for a long time so I could take a workshop every day. The second workshop I took was a family pick. My Grandmother and two of my aunts and I signed up in the first 30 minutes to make sure we could all get a spot with Weeks Ringle. Because life happens it turned out that her husband Bill came instead. We had a really good time with him. The workshop was all about roll of colour in a quilt. We also talked quite a bit about edge. Bill explained that the two couldn't really be separated. 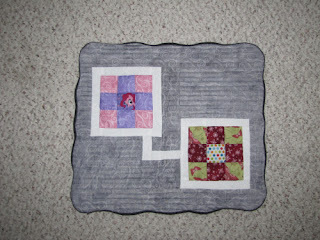 Both were necessary for a good quilt. I am finding that to be absolutely true in the work that I do. It was very necessary to think of both when I chose to make a portrait of my daughter. There are endless pieces of Rebecca in this quilt. The purple and pink are obvious. Her favourite part is the Pinkie Pie in the middle. The first pod is the princess that she loves to be. It was the first major part of her personality to shine. The second pod is her love for what her Daddy has introduced her to - Marvel, Starwars, etc. 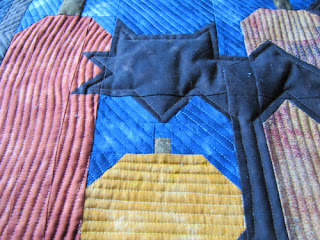 The straight lines of the blocks and of the quilting and the traditional 9-patch speak to how her mind works, the way she likes to think inside her box. The curved edges are all about her imagination and the fun she has when she plays. 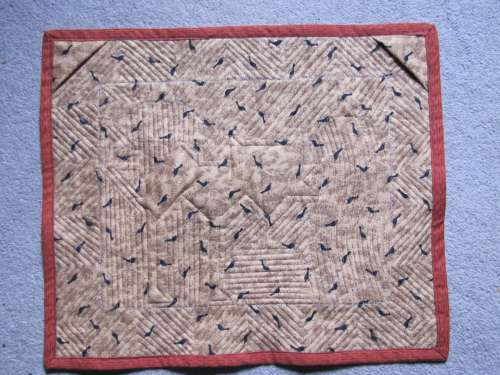 I did micro "scribbling" in the white space of the quilt. Just those two little spaces took a whole bobbin. I kind of cheated for this assignment. Bill told us what to do before lunch and I realized that most of the fabric I brought with me wouldn't work. Off to the merchant mall I went. I felt a bit like I was on a timed shopping spree as I went from booth to booth looking for "Rebecca". A lot of the fabric I bought, I normally wouldn't look twice at. .
Pattern: Inspired from pods in a craftsy.com class. Fabrics / Best Buys: Most was bought from the Merchant Mall at Quilt Canada - Yay for $2 fat quarters. I used the back of grey fabric because the front was too harsh for the subject matter. Lessons Learned: I tried a new binding technique with curved edges. This is the tutorial I used. Sew Very Easy The curves turned out perfectly, but the binding process did not. I'll need to think about how I can make it more uniform for next time. Thoughts: This was a very challenging and very personal project. As we went around the table at the workshop and discussed our work, there were profound thoughts and even tears as people discussed their journeys and loved ones. It was good. One of my favourite things is when I'm given blocks or UFOs from our local MCC Thrift Store. 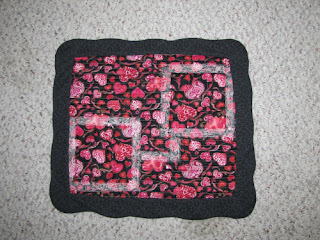 I have a friend and fellow quilter there who sometimes passes things on. The idea is to finish them and send them back. MCC can sell a finish for much more than the sum of the parts. Pattern: Unknown - the top came finished with the exception of the outer border. Fabric: All from MCC except outer border and binding. They were from my stash. Thoughts: I'm not a Halloween girl, but I'm sure someone will love this. All the quilting on this was a walking foot at ¼". I used to have a ½" walking foot. I think it met an accidental end. I think I might want to invest in one to make thicker rows. 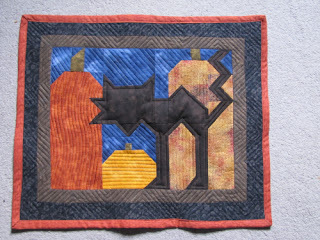 My quilting group and I are likely to put on a show at the library next spring. I'll show it there and then send it back to MCC for sale.